A new book by James Gleick is a much-anticipated thing. Admittedly he hasn’t always lived up to the promise of his excellent Chaos, but most of his books have been top notch. 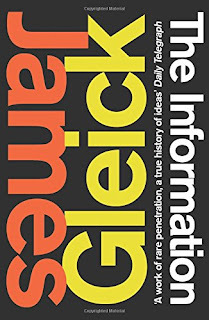 In The Information, Gleick gives us a full bore account of the defining feature of our age. 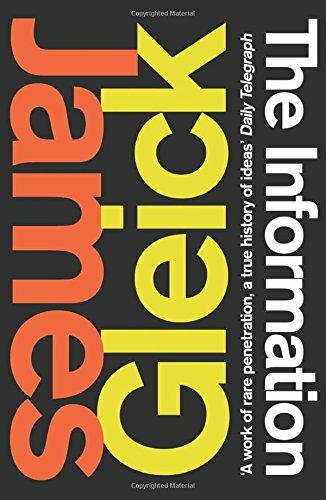 We explore the nature of information, how it has been communicated from the written word and jungle drums through to the internet, and, perhaps most fascinating of all, Gleick takes us through the social historical impact of a burgeoning quantity of information. It’s fascinating that the whole idea of information overload was first brought up not as a result of the internet, but hundreds of years earlier as a response to the flood of information that the printing press released on the world. And then again for microfilm. Rather oddly for someone who has made their name as a science writer, Gleick comes across best in the social history sections. The more detailed the science, the more he loses us. In part this is down to the Claude Shannon effect. Shannon is an absolutely central figure in information theory, and yet every book I’ve ever read that featured him gets dull when he is mentioned. I don’t know why, exactly, but Shannon is like one of those people at parties who can be talking about the most exciting subject and yet make it depressingly boring. You can’t write a book like this without having a lot of Shannon turning up, but it does make it difficult for the writer to keep the reader’s attention. I also thought that Gleick could have made more of the whole ‘it from bit’ cosmological theory – it comes across very vaguely, without the scientific backing you might expect. But there is so much more to enjoy, whether it’s one of the best accounts of Babbage and Ada King (not Lovelace) and the emerging concept of computing, or Turing’s work, or telegraphy wireless and otherwise. It’s a rich (if not always well-structured) concoction of information about information. There’s so much information in there, you suspect that Gleick’s research was occasionally a bit thin. So, for instance, he refers to the transistor pioneer William Shockley as an Englishman. Shockley was an American, brought up in America. The only reason I can imagine anyone calling him English is that when you glance at his Wikipedia entry (and yes, Wikipedia gets a fascinating write-up in the book), it jumps out of you that he was born in London. Read a little further, though, and you’ll see this is just because his American parents happened to be there at the time. I do also have a couple of small issues with this book as a whole. Firstly it’s a doorstop. I seriously dislike books this thick, and it’s a mark of how good the good parts are that I put up with a 526 page tome. There are a couple of chapters that could be done away with entirely, and there’s a lot of unnecessary flowery text. The other issue is that it can stray a little into the pretentious. This comes across perhaps most strongly in the title – putting ‘The’ upfront feels very calculated.